One of the values that I desperately want to teach my children before they leave the nest is how to be a wise person with their money. I feel like the education system doesn’t do a great job of preparing kids to really understand the principles behind spending and saving. And a high value of ours as a family is also to be a generous giver. As a parent, I do believe it is MY job to instill these principles in my kids and not the education system. Our kids earn money each week for their chores (<—click here to see how we handle chores) and also receive money throughout the year for their birthdays and special events. So they have needed a tangible system of how to spend, save and give their money. So I came up with these cute personalized spend save give banks to help my kids understand these principles we are trying to install in them. 1. I found these cute little display boxes at Jo-Ann Fabric and Craft stores. With a hammer I knocked off the little ball on the side of the box. 2. I then reglued 1.5” wood balls with wood glue on each side. 3. Then I painted one coat of Home Décor Chalk onto the display box. 4. Next I cut out vinyl letters on my Silhouette Cameo machine of each of my children’s names. You could also use stickers to spell out the child’s name if you don’t have a digital cutting machine. 5. 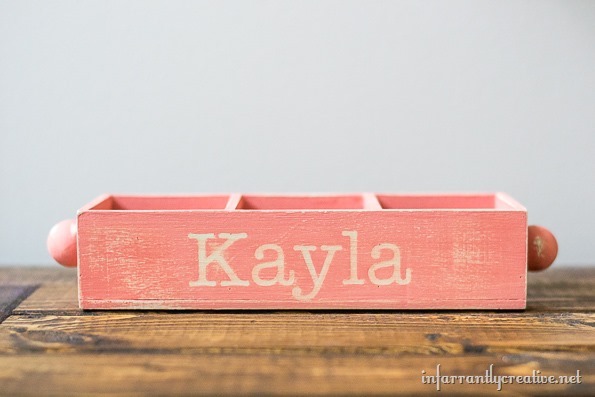 I painted another color of Home Décor Chalk over the entire box. 6. While still wet, I removed the vinyl stickers to reveal the paint color underneath. 7. With a damp rag I “sanded” the edges of the box to reveal the color underneath to give it some depth of color. 8. Then I placed jar lid bank slot inserts onto each quilted jelly jar. 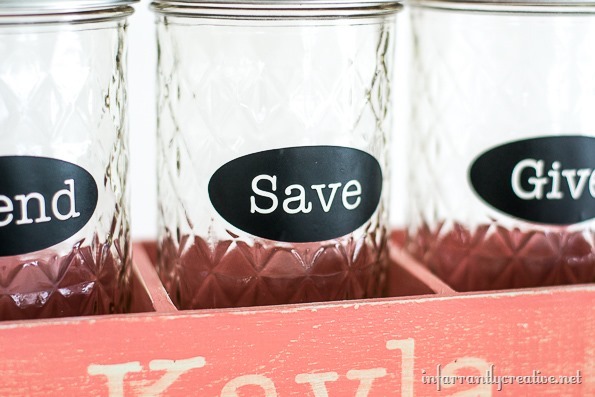 Optional: On the front of the jelly jars use a Silhouette Cameo machine to cut out vinyl stickers to spell out Spend, Save and Give. Click here for file. You could also use stickers or a permanent marker to write on the front of them if you don’t have a digital cutting machine. Display them somewhere prominent for the kids to see how much money they have for each category. It is so awesome when my kids see a need in our community and they are able to give to it. It has taught them to be cheerful givers and look out for the needs of others and not just themselves. Once money goes into a jar it doesn’t come out unless it is used for the purpose it was intended. In the past year my kids chose to give their money to our local church, the American Heart Association, a local food pantry, an organization that helps women who can’t afford diapers and formula for their babies, and our local children’s hospital. I can’t tell you how my heart explodes when I see my kids giving generously. If you teach them to be generous when they are young and have little to give, they will most likely grow up to be cheerful givers and be able to really make a difference in the lives of people. 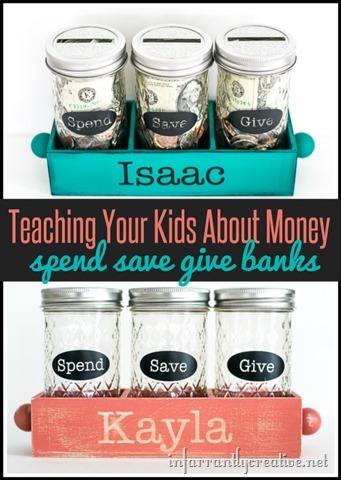 And the save category is used if my kids are trying to save up for something big or if my kids choose to put a certain amount of money in the bank for a rainy day. The spend category is an agreed upon thing and they can’t take out of their “save jar” just to spend it on something silly. The goal is to teach them the hard work of saving up for something and learning to delay gratification and pay cash for things they want. What tips and tricks do you use to teach your children about money? Here are some other posts that might interest you….